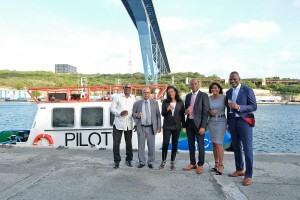 Steven Martina, Minister of Economic Development in charge with CPA/KTK, and Mrs. Audrey Tjon A Loi, partner of CPA/KTK's Chairman Mr. Irving Moeniralam, in the traditional act of the boats. The boats were blessed by Pastor Mark of the parish Santa Familia. KTK-Director Mr. Surldric Rojer had a brief introduction, followed by a speech by Minister Martina. 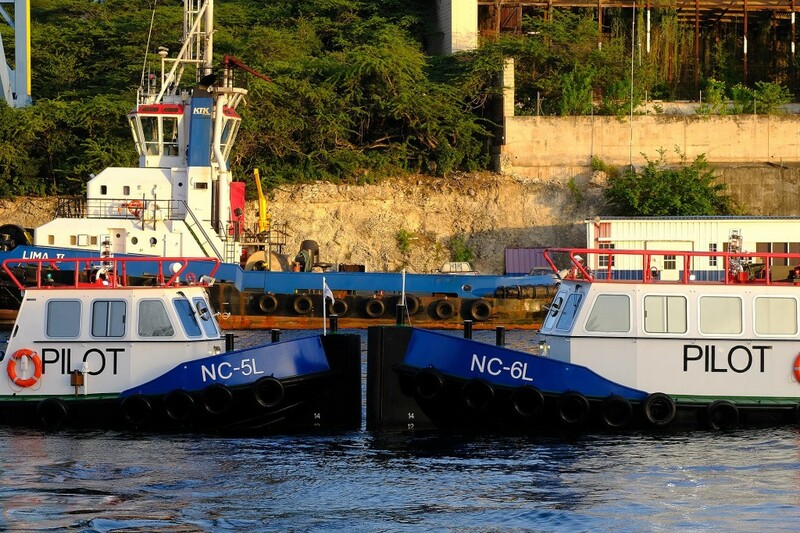 The design of NC 5 and NC 6 is very similar to the 'pushy cat's boats that for last 30 years were very well known for the transportation of pilots and crew members, and also for the task of mooring of ships. The choice for this model boats is based on the fact that the division of KTK charged with transportation of pilots and mooring of ships with the same type of boat can continue to deliver their services. The boats are multi-usable which contributes to the flexibility and efficiency of the tasks that the staff of KTK performs. It shall also take account of safety aspects with regard to the transportation of pilots. The cabin is more spacious and super quiet in terms of sound, which is very important for all on board. Both boats can push and pull 5 tons, and pick up a speed of 9 knots. All two boats have one engine, but with two rudders they are very well controlled. Slieker & Zonen B.V. in Dordrecht, Netherlands, built the NC 5 and NC 6 in accordance with the standards of NSI (Dutch shipping inspection) and they comply with the latest environmental and quality standards. NC-5 L is 12.5 meters long and NC 6 L 14.5 metres.